Strictly speaking, “travel photography” could be defined as the documentation of an area's landscape, scope and sphere of activity, but I don't think that definition really tells the tale. To photographers, travel photography involves telling the story of an area through photographs which speak about its physical landscape, its cities and towns, its outposts and their history, people, and culture, but there are more elements of travel photography. Travel encompasses both the human-made and natural worlds. So, in addition to the human-made world, travel photography includes telling the story of the natural world and it's physical landscape, history, its denizens and their way of life. There is still one more, often forgotten element of travel photography. Travel photography includes travelers and their experience. Unsurprisingly, many travelers, including business and leisure travelers, are travel photographers themselves, be it via a point and shoot, a cellphone, or expensive DSLR. They are also often travel's writers and oral biographers, themselves travel documentarians, be it in a journal, on social media, in emails or letters or in professional articles. Their stories and their memories are the last element of the travel photographer's millieu. To tell their stories, travel photographers try to produce the highest quality images possible, but the variety of scenes and conditions they encounter can make that difficult. As a result, travel photography requires photographers to have the widest possible skill set. I have a series of tips which can help you overcome some of those difficulties and improve your travel photography. The human brain needs something familiar, of a known size, to judge a scene's scale. Having a person or people in a photograph gives viewers a measuring stick to judge the scale displayed in the image. As discussed in my article, What makes a photograph great, “More often than not, the photograph you remember and the one which elicits a 'Wow!' tells a story.” Using a person in a photo can help the image tell its story. People in travel photographs can also be used to add interest, create mood and give context. Frankly, most family and group travel shots are boring. In them, everyone is usually standing still in front of a famous landmark. Instead, catch them in a pool swimming together, running in a field or along a beach, biking, playing ball in a city square, or maybe hiking in a national park. Have them in action at the landmark. Nothing can replace research, before you leave on your journey, to find the best places to visit and photograph at your destination, but once you get there, speak to locals to find out about special places known only to them. If you're in front of a famous landmark, don't merely backup far enough to get a frontal shot from street level, the image everyone makes. 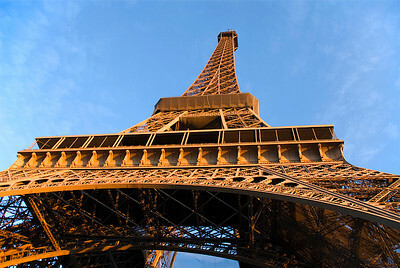 Shoot landmarks from a variety of perspectives, such as in my Eiffel Tower image above, shot from underneath looking up. Find a raised platform to shoot down. Get low on your knees or lie down. Shoot at a corner angle instead of straight on the front. When we make a photograph, we're painting the image with light. Don't merely get the exposure right for your photos. Use light to sculpt them, when possible. For example, in early morning or late afternoon, when the sun is low, the shadows are long giving you an entirely different look than at noon. When you have shadows, you can generally define edges better in the image and create more depth. The golden hours are generally the hour immediately after sunrise and directly before sunset. The length of time the golden hours last depends on the time of year and your location. The light during the golden hours is literally golden to somewhat reddish in hue. It's highly dispersed because it's so low. Its warm tones are typically flattering to most people. Shadows are long which helps give the image depth. Extra Tip: I use the Golden Hour iPhone app ($1.99) to plan my golden hour shoots in advance. The Golden Hour app (free) for Android is highly rated, but I've not personally tested it. Many people on bus or car rides often miss remarkable photographs because they think they can't get great shots from a moving vehicle. Such shots can have ugly reflections or just be a blurry mass. These problems can be overcome. I use a rubber lens hood while riding in a bus or car during trips. It lets me place my lens hood against vehicle windows eliminating reflections, while protecting the lens and the window during bad bounces. By increasing my shutter speed to at least 1/1000 second, I can normally eliminate blurr in my shots from a moving vehicle. If they're still blurry, which can happen if you're shooting something close, raise the shutter speed more. While on a tour, or just walking around an area, far too many photographers miss great shots because they have tunnel vision looking forward, never noticing fantastic scenes behind them. Turn around regularly to check the scene behind you. If you keep these tips in mind while traveling, I think you'll find an improvement in your travel photography. Bon voyage.